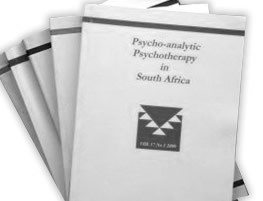 The professional journal, Psychoanalytic Psychotherapy in South Africa (PPSA) is a non-profit journal, established in 1992 by Trevor Lubbe, a child psychoanalytic psychotherapist and Tony Hamburger, a clinical psychologist. The objective of the PPSA journal is to act as a vehicle for psychoanalytic thinking in order to develop psychoanalytic psychotherapy in areas of theory, clinical practice, training and research. The PPSA journal is Department of Education accredited for research subsidy purposes: ISSN 1023-0548. It is a peer reviewed journal. PPSA is the official journal of the South African Psychoanalytic Confederation (SAPC). SAPC is the umbrella organisation of various psychoanalytic professional groupings in South Africa. Most mental health professionals, many of whom are clinicians, who work within a broadly psychoanalytic framework belong to SAPC. Copyright © 2019 - PPSA Journal. All Rights Reserved. Website designed and developed by AltonSA.